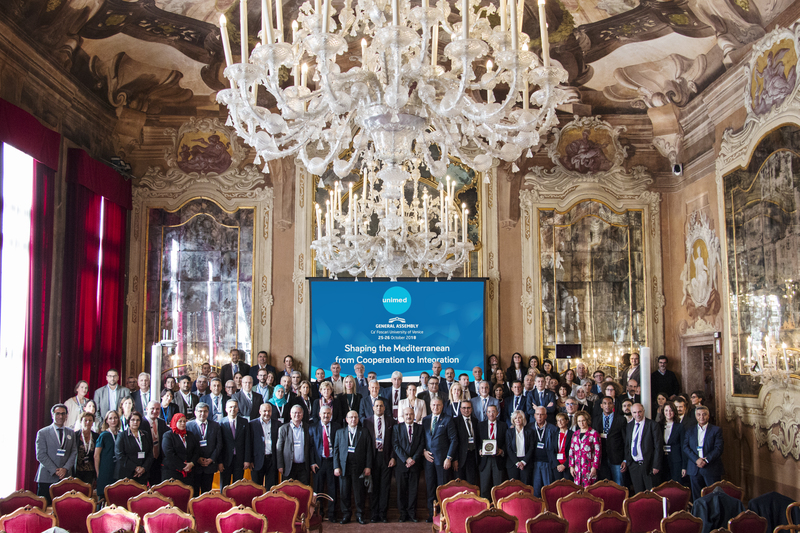 The UNIMED General Assembly 2018, celebrated in Venice at Cà Foscari University on 25 and 26 October 2018, has been an occasion for UNIMED to take stock of achievements and to set the strategic axes of development. Most notably UNIMED General Assembly 2018 voted to renew the Board of Directors and the Presidency. (Rome, 30 NOV 2018) The last UNIMED General Assembly in October 2018, hosted by Ca’ Foscari University of Venice during the celebration of its 150th anniversary, has been a crucial moment for UNIMED as it had to renew its governing bodies and to set the strategic axes of development for the upcoming three-year term Presidency and beyond. The General Assembly opened its proceedings with the speech by the exiting UNIMED President prof. Wail Benjelloun, who took stock of the achievements of his three-year mandate to suggest future strategic axes of development for the Association and to confirm his willingness to continue his engagement in the Board of Directors. The Director of UNIMED, dr. Marcello Scalisi, in his introductory speech thanked the President and the Secretary General prof. Hmaid Ben Aziza, former Rector of University of Tunis, for their “relentless and precious contribution to the development of UNIMED”, which now has 113 associated Universities and it is involved in 33 cooperation projects, which promotes student and university staff mobility, university governance and social responsibility, refugees, learning innovation, employability and sustainable development. On the second day the General Assembly met to discuss strategic issues of the Association and to vote for the renewal of UNIMED’ Boards of Directors, most notably of the President, the two Vice Presidents and the Secretary General. Besides the statutory activities of the General Assembly, the UNIMED Team showcased the main features of its 33 cooperation projects and it organised also a series of workshops and trainings, open to its associates and external participants, on strategic topics for the future of the Mediterranean integration such as: governance of Higher education Institutions- HEIs, e-learning and open education, sustainable development, employability, among others themes of expertise, fostering integration in the Mediterranean. Eventually it has been a moment to open the dialogue to other organisations working for and in the Mediterranean, and remark the presence of UNIMED as an actor advocating for stronger support of policy makers.